December 2014 | Pentaflex INC. December 2014 | Pentaflex INC.
Pentaflex management team attended the 2014 FABTECH conference and exposition in Atlanta, Georgia. The conference was attended by 30,000 attendees involved with metalforming, welding, assembly, and coating operations. There were 1500 exhibitors displaying equipment and services at Georgia World Congress Center in the 550,000 square feet of space. The FabTech show was used to introduce the winners of the Precision Metalforming 2014 Manufacturing Excellence awards. For the second year in a row, Pentaflex was selected as the winner for awards in two of the seven categories. 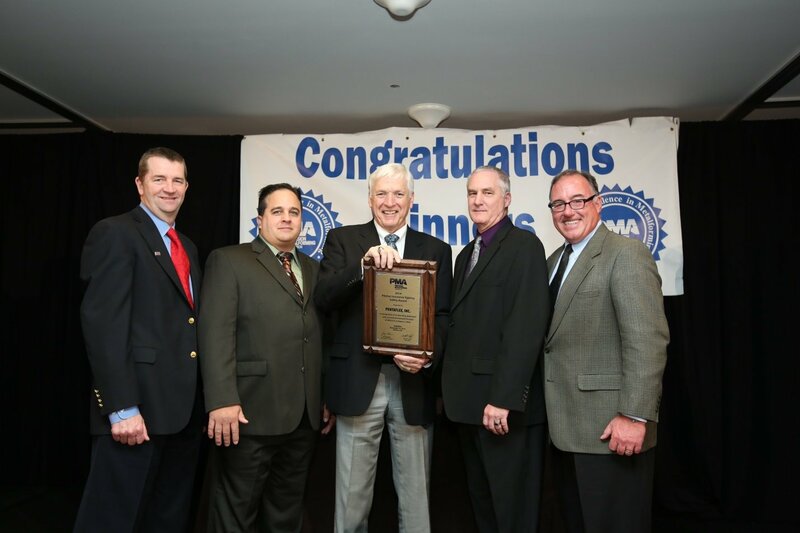 Pentaflex won the awards for Safety and Education-Training. Press releases, articles in the Metalforming Magazine, videos on the PMA website, and recognition in the PMA booth at the FABTECH show discussed the Pentaflex awards. The videos which detail the actions that Pentaflex took to achieve the awards are a new feature to the awards process and present a great picture of the Pentaflex business. 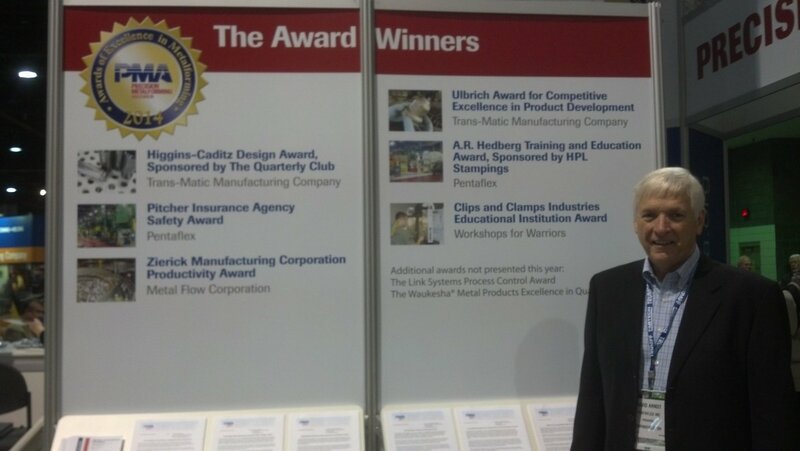 Pictures from the PMA awards ceremony and the Awards of Excellence display at the FABTECH show are shown below. As always, FABTECH delivered a great opportunity for manufacturers from the U.S. and 70 other countries to see new technology, attend educational seminars, and network with peers. Manufacturers were exposed to keynote presentatons from senior executives about on-shoring and given insights on the future of US manufacturing. In addition, in honor of Veterans day, there were special events honoring veterans and an emphasis on connecting organizations that sponsor matching veterans with manufacturers for job opportunities. FABTECH attendees and exhibitors also raised more than $10,000 thru FABTECH Expo Cares program to benefit Workshops for Warriors, a nonprofit organization dedicated to training, certifying, and placing veterans in manufacturing careers.